For the cricketer and footballer, see Stanley Harris (footballer). Stanley Raymond "Bucky" Harris (November 8, 1896 – November 8, 1977) was an American Major League Baseball player, manager and executive. In 1975, the Veterans Committee elected Harris, as a manager, to the Baseball Hall of Fame. Of Swiss and Welsh descent, Harris was born in Port Jervis, New York, and raised after the age of six in Pittston, Pennsylvania. His father, Thomas, had emigrated from Wales, while his mother, Catherine (Rupp), hailed from Hughestown, Pennsylvania. His elder brother, Merle, was a minor league second baseman. Bucky Harris left school at age 13 to work at a local colliery, the Butler Mine, as an office boy and, later, a weigh master. In his spare time, Harris played basketball for the Pittston YMCA team as well as sandlot baseball. Harris was listed as 5 feet 9 inches (1.75 m) tall and 156 pounds (71 kg); he threw and batted right-handed. 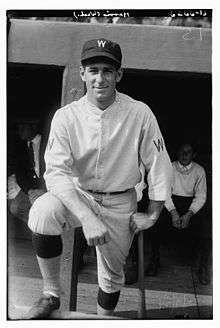 In 1916, when Harris was 19, Pittston native and future Hall of Famer Hughie Jennings, then the manager of the Detroit Tigers, signed him to his first contract and farmed him to the Class B Muskegon Reds of the Central League, where he struggled as a batsman and was released. Harris then caught on with the Scranton Miners, Norfolk Tars and Reading Pretzels through 1917, before reaching the highest level of minor league baseball with the 1918–19 Buffalo Bisons of the International League. Harris improved his batting skills during the latter season with the Bisons, making 126 hits and raising his average to .282. He then was recommended to the Washington Senators by baseball promoter Joe Engel, who led the Chattanooga Lookouts at Engel Stadium. In August 1919, at the age of 22, he came up to Washington but was unimpressive at first, batting a meager .214 and getting into only eight games that first season. Despite this poor showing, owner-manager Clark Griffith made him Washington's regular second baseman in 1920, and before long Harris was batting .300 and making a mark for himself as a tough competitor, standing up to even ferocious superstar Ty Cobb, who threatened Harris when he tagged Cobb in their first encounter. Harris spent most of his playing career as a second baseman with the Senators (1919–28). In 1924, he was named player-manager; at the age of 27 he was the youngest manager in the Majors. He proceeded to lead the Senators to their only World Series title in Washington in his rookie season, and was nicknamed "The Boy Wonder." He won a second consecutive American League pennant in 1925, but the Senators lost the 1925 World Series in Pittsburgh in the late innings of Game 7 after leading 3-1 in the Series. Baseball historian William C. Kashatus wrote of his dominant play in the 1924 World Series: "Not only did he set records for chances accepted, double plays and put-outs in the exciting seven-game affair, but he batted .333 and hit two home runs". His initial departure from the Senators in 1928 (he would twice return to manage them again from 1935–42 and 1950–54) came in a trade to the Tigers as player-manager. However, for all intents and purposes, 1928 was his last year as a full-time player. He only made 11 cameo appearances in the Tiger lineup—seven in 1929 and four in 1931. In all, he appeared in 1,263 games played, and collected 1,297 hits, with 224 doubles, 64 triples, nine home runs, 472 bases on balls and 167 stolen bases. He batted .274 lifetime with 508 career runs batted in. In addition to his three separate terms as field leader of the Senators, Harris also managed the Tigers twice (1929–33 and 1955–56), Boston Red Sox (1934), Philadelphia Phillies (briefly known as the Blue Jays, 1943) and New York Yankees (1947–48). After his back-to-back pennants in 1924–25, Harris was able to keep the Senators in the first division for the next three seasons, but their win totals declined, from 96 (1925) to 81 (1926), 85 (1927) and then only 75 (against 79 losses, 1928), leading Griffith to trade Harris and change managers (naming Hall of Fame pitcher Walter Johnson as Harris' successor). The 1928 Tigers had won only 68 games, and Harris's 1929 edition offered only a slight improvement, winning 70. In five full seasons as the Tigers' manager, Harris produced only one winning year, 1932, when Detroit went 76–75 and finished fifth and 29½ games behind the Yankees. In the waning days of 1933, Harris stepped down. His eventual successor, Mickey Cochrane, a future Hall-of-Fame catcher who was acquired from the Philadelphia Athletics, would lead the Tigers as a player-manager to back-to-back pennants in 1934–35 (and their first-ever world championship in the latter year). Harris signed as manager of the Red Sox for 1934. The Red Sox were then a habitual tail-ender in the American League, and had registered 15 consecutive losing seasons since their 1918 world championship. The 1933 Red Sox had won only 63 games and finished seventh in the eight-team AL under Marty McManus, but their wealthy new owner, Tom Yawkey, had begun a major rebuilding of both the ball club and Fenway Park. Yawkey jettisoned McManus and personally selected Harris as his new manager, and his 1934 Red Sox, despite an injury-riddled season by newly purchased ace left-handed pitcher Lefty Grove, broke the losing-season streak, finishing at .500 (76–76). But Harris's stay in the Boston dugout lasted only one season. He and Eddie Collins, the Red Sox' general manager, had feuded since their playing days and Yawkey may have hired Harris without consulting Collins. When Joe Cronin, the hard-hitting, 28-year-old playing manager of the Senators, became available on the trade market, Yawkey and Collins moved quickly, sending shortstop Lyn Lary and $225,000 to Washington on October 26 for Cronin, and then naming him manager for 1935. Harris then took Cronin's old job, returning to Clark Griffith and the Senators. Harris's second term in Washington lasted for eight seasons (1935–42), his longest tenure as a skipper, but produced no repeats of 1924–25. Only one of Harris's teams, the 1936 Senators, had a winning record (82–71) and first-division finish. Harris kept the club out of the American League basement, but three consecutive seventh-place finishes (1940–42) led to his departure and his only season in the National League as skipper of the 1943 Phillies. Perhaps the worst team (42–109, .278) in baseball in 1942, the Phillies had just been sold to lumberman William D. Cox. Under Harris, the 1943 edition improved to play .424 baseball (39–53), but on July 27, the manager was abruptly fired. Harris then played a role in Cox' banishment from professional baseball for betting on games. Harris's friends, outraged at his firing, informed Commissioner of Baseball Kenesaw Mountain Landis that Cox was violating baseball's anti-gambling mandate. Landis then summoned Harris to his office to testify in person about Cox' behavior; the owner was suspended indefinitely three months later, and the Phillies were sold to R. R. M. Carpenter in November 1943. Harris then spent three seasons out of the Major Leagues as general manager (1944–46) and field manager (in 1944–45) of the Buffalo Bisons, his old team in the International League. In August 1946, the Yankees' co-owner and GM, Larry MacPhail, appointed Harris to a front-office position. The tumultuous 1946 season saw MacPhail employ three managers—Joe McCarthy, Bill Dickey and Johnny Neun—and finish third, 17 games in arrears of the pennant-winning Red Sox. At the close of the season, MacPhail named Harris the Bombers' 1947 manager, and he led them to his third American League pennant, and the Yankees' 15th league title. Behind Most Valuable Player Joe DiMaggio and newly acquired starting pitcher Allie Reynolds, the 1947 Yanks won 97 games and prevailed over the Tigers by a 12-game margin. Then they won Harris's second World Series championship when they defeated the Jackie Robinson-led Brooklyn Dodgers in a thrilling, seven-game Fall Classic. Harris returned to the Yankees in 1948. His 1948 club won 94 games to finish a close third in a hectic pennant race, two games behind the Cleveland Indians and Red Sox, who ended the regular season in a tie for first place. But the result dissatisfied the Yankees' post-MacPhail ownership team, Dan Topping and Del Webb, and their new general manager, George Weiss, and they replaced Harris with Casey Stengel. Stengel would lead New York to ten American League pennants and seven World Series titles in the next 12 seasons. Harris returned to the minor leagues in 1949 as manager of the San Diego Padres of the Pacific Coast League before launching his third stint as skipper of the Senators, coming off a 104-loss 1949 season. He led them to a 17-game improvement in 1950, and to a winning (78–76) mark in 1952, but the Senators could not escape the second division in Harris's five-year, final term as Washington's manager. Nevertheless, the Tigers chose Harris to replace Fred Hutchinson as their manager for 1955, and in the first season of his second term in Detroit, Harris again produced a turnaround. The 1955 Tigers won 79 games (eleven more than in 1954) and had their first above-.500 season since 1950, then won 82 games in 1956. But the Tigers finished fifth each season, and were experiencing turmoil in their front office: outspoken owner Walter Briggs, Jr., was harshly critical of Harris and his coaches during the season and was in the process of selling the team. Fired by new owner Fred Knorr, Harris closed out his 29-year MLB managing career with a win-loss record of 2,158–2,219 (.493). As of 2014, Harris ranked seventh in MLB manager career wins. In 1957, he rejoined the Red Sox as assistant general manager and then, at 62, succeeded Joe Cronin as GM in January 1959—24 years after Cronin had displaced Harris as Boston's field manager. Harris served for two losing seasons as general manager of the Red Sox before his firing in late September 1960. On his watch, the Bosox finally broke their own baseball color line by promoting Pumpsie Green from Triple-A on July 21, 1959, more than twelve years after Robinson's debut with the Dodgers. But the Red Sox went 75–79 in 1959 and fell into the second division, beginning a streak of eight straight losing seasons. Then, in 1960, Hall of Famer Ted Williams's final season, they won only 65 games and finished seventh in the eight-team league. Rightfielder Jackie Jensen, 1958 American League MVP and the AL's 1959 runs batted in leader, sat out the entire 1960 campaign in retirement due to his fear of flying. Harris's two highest-profile trades saw him send left-handed pitcher and former bonus baby Frank Baumann to the Chicago White Sox and catcher Sammy White to the Indians. But Baumann led the AL in earned run average with the 1960 Chisox (while the player Harris obtained, first baseman Ron Jackson, played only ten games with Boston before being traded away again) and White abruptly retired rather than report to Cleveland, canceling his trade. Harris also ran afoul of Yawkey when he fired Yawkey associate Pinky Higgins as manager and replaced him with Billy Jurges, a Senators' coach, on July 3, 1959, without consulting the owner. Jurges lasted less than a calendar year as the Red Sox' pilot before his firing in June 1960—and replacement by Higgins. Harris ended his long MLB career as a scout for the White Sox (1961–62) and special assistant for the new expansion Washington Senators franchise that played in D.C. from 1961 to 1971 before moving on to Arlington, Texas. He died in Bethesda, Maryland, on his 81st birthday, and was buried at St. Peter's Lutheran Church in Hughestown, Pennsylvania. Harris's father-in-law during his first marriage, which ended in divorce in 1951, was Howard Sutherland, former United States Senator from West Virginia. 1 2 3 Kashatus (2002), p. 76. 1 2 3 Kashatus (2002), p. 74. ↑ Kashatus (2002), pp. 74–76. 1 2 Kashatus (2002), p. 75. 1 2 3 4 5 6 7 8 "Bucky Harris". Baseball Reference. Sports Reference. Retrieved September 18, 2015. Wikimedia Commons has media related to Bucky Harris.